TCBG strives to make its software accessible to the biomedical community through a variety of training opportunities, workshops, classes, presentations and demonstrations. For those who cannot attend these training events, we post and maintain tutorials that scientists can work through at their own speed, as a means of learning the best use of the VMD and NAMD software packages. The page below offers tutorials on tools created by TCBG, and some tutorials from other groups. 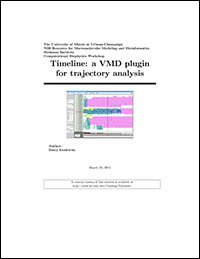 Proceeding through a tutorial requires a copy of the tutorial text (in pdf or html format), tutorial files in place on the user's computer, and installation of VMD, NAMD, and other required software as documented at the start of each tutorial. Most of the tutorials are usable on Windows, Mac, and Unix/Linux platforms. It is suggested that you use the latest machine you have available; while the tutorials will run on older machines, it may be slow going. 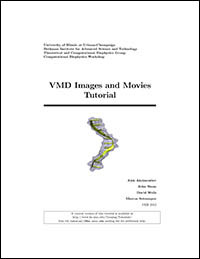 These tutorials focus on VMD-specific features, although many others utilize VMD as well. Be sure you have the latest version of VMD. Participants build an image of ubiquitin while becoming familiar with basic VMD commands. Additionally, participants learn how to look for interesting structural properties of proteins using VMD. Tutorial works on Windows, Mac, and Unix/Linux platforms. This tutorial introduces the user to the QwikMD plugin and how to prepare MD simulations using QwikMD. Tackling common scientific problems, the user is introduced to several QwikMD functions, from selecting the initial structure to performing point mutations, membrane insertion and preparing complex residues. Tutorial works on Windows, Mac, and Unix/Linux platforms. This tutorial is designed to give users of VMD an introduction to advanced techniques for making custom images and movies. The first section describes how to use features such as resolution, color, material, and depth perception to enhance still images. The second part demonstrates how to work with trajectories using techniques such as smoothing, showing multiple frames at once, and making atom selections "follow" a trajectory. It also shows how to create a movie file from a trajectory using VMD's Movie Maker plugin. Tutorial works on Windows, Mac, and Unix/Linux platforms. This tutorial describes two VMD plugins that can be used to detect and correct certain structure errors, namely chirality and cis peptide bonds. The plugins can also be used to prevent these errors from occurring in simulations with NAMD. Requires VMD and NAMD. Tutorial works on Windows, Mac, and Unix/Linux platforms. VMD can be used to load files that contain quantum mechanics (QM) data such as GAMESS log files and Molden files. 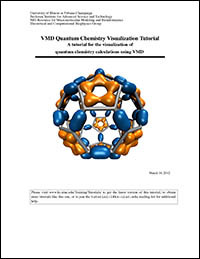 With QM data loaded, VMD can display molecular orbitals, as well as access the calculated energy levels and various other data present in the loaded files. In this tutorial output from the GAMESS program will be used to provide input for visualization of QM Data using VMD. Requires VMD, GAMESS. For users seeking to learn about a specific use of VMD. 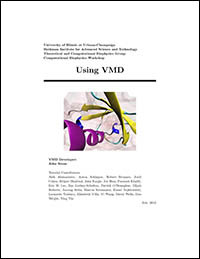 Guides participants in using VMD for visualizing results from molecular dynamics and electronic structure calculations, as produced by the CPMD program. Produced by Axel Kohlmeyer. 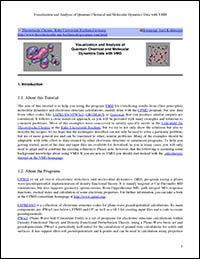 Video lectures: an introductory video, "Introduction to VMD Molecular Visualization and Analysis", recorded by Dr. Emad Tajkhorshid in November, 2007 is available here. 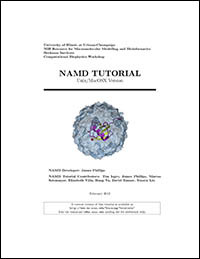 Participants learn how to use NAMD to set up basic molecular dynamics simulations, and to understand typical NAMD input and output files, with an emphasis on such files for protein energy minimization and equilibration in water. Tutorial versions available for Windows, or Mac and Unix/Linux platforms. This tutorial is designed to guide users of VMD and NAMD in the use of the tclForces and tclBC scripts. These script-based facilities simplify the process of adding complex forces to systems and implementing boundary conditions. Tutorial works on Windows, Mac, and Unix/Linux platforms. 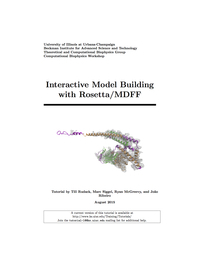 For a brief introduction to running interactive molecular dynamics simulations, see the documentation here. 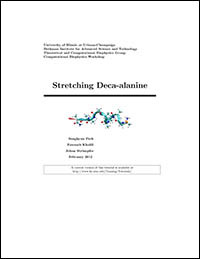 The tutorials on Simulation of Water Permeation through Nanotubes and on Stretching Deca-Alanine both utilize IMD. 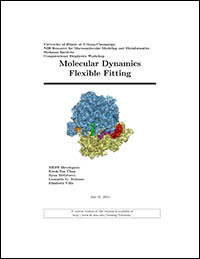 Please also see the NAMD Tutorial, the Stretching Deca-Alanine tutorial, and the Methods for calculating Potentials of Mean Force tutorial for content on steered molecular dynamics. 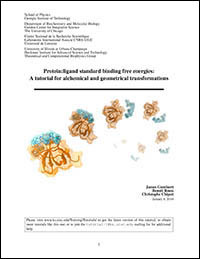 This tutorial sets out to demonstrate that the standard binding free energy of a protein:ligand complex can be determined accurately by means of restrained computer simulations. In the tutorial, calculation of the contribution due to restraints follows two distinct routes, an alchemical one and a geometrical one. The methodology is illustrated by the association of a small, proline-rich peptide to a tyrosine kinase. For users seeking to learn about a specific use of NAMD. Discusses setting up the system and calculations needed for free energy calculations of alchemical transformations within NAMD. For users seeking to learn about a specific use of NAMD. 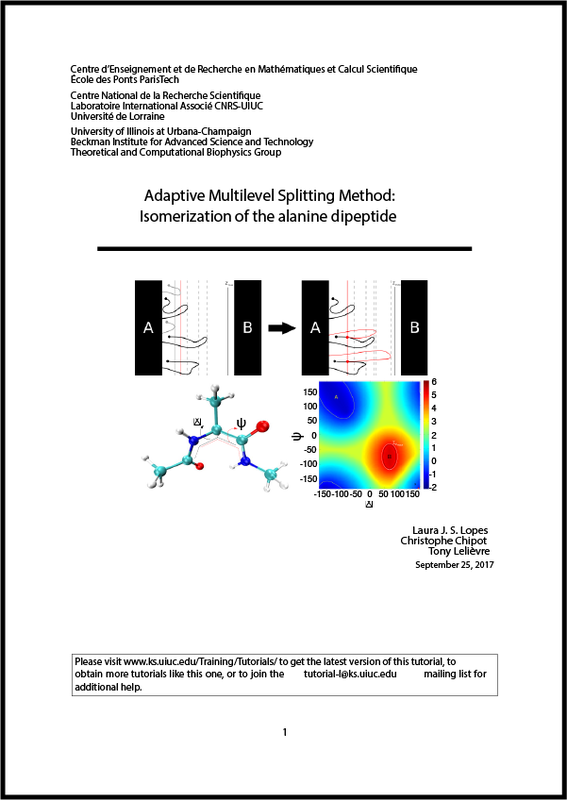 Discusses setting up the system and calculations needed for adaptive biasing force calculations of conformational transitions within NAMD. This tutorial will introduce the user to interactive molecular dynamics (IMD) and steered molecular dynamics (SMD) simulations, and to the calculation of potential of mean force (PMF) from trajectories obtained with SMD simulations. Requires VMD and NAMD. Tutorial works on Windows, Mac, and Unix/Linux platforms. In this tutorial, applications of steered molecular dynamics, adaptive biasing forces, and umbrella sampling to the ammonium transporter AmtB are explored. Steered molecular dynamics will be used first to gain an approximate knowledge of the permeation pathway and the barriers along it. 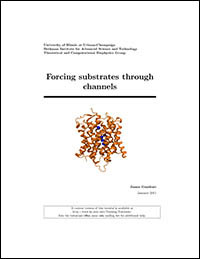 Then, the potential mean of force for ammonia in the central region of the channel is calculated using adaptive biasing forces as well as umbrella sampling, with and without replica exchange. The appropriate choice of parameters and potential difficulties will also be discussed. Requires VMD, NAMD, and a plotting program. 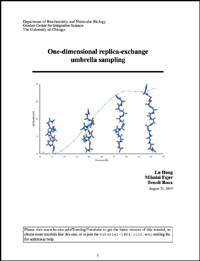 This tutorial introduces replica exchange umbrella sampling (REUS) simulation method using NAMD. 16 independent replicas of deca-alanine in vacuum is created and then to each replica a harmonic biasing potential is added to the distance between the two termini of the polypeptide. From the results of the simulation the free energy of the system is calculated as a function of the distance using WHAM. This tutorial assumes familiarity with the basics of NAMD, VMD, Tcl and the Linux CLI. This tutorial sets out to determine the free-energy difference between two conformational states of a short, terminally blocked peptide, N-acetyl-N'-methylalaninamide, along a meaningful transition pathway. To reach this objective, use will be made of the string method with swarm of trajectories. Starting from a guess, rectilinear transition pathway connecting the C7eq and C7ax conformational states in the (φ, ψ) backbone-torsion subspace, the most probable, minimum-action path will be sought. The free-energy change along this path will be subsequently estimated, employing path-collective variables in the framework of the adaptive biasing force importance-sampling algorithm. 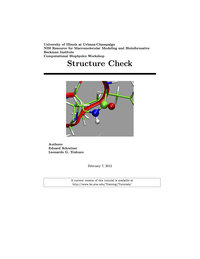 The key objective of this tutorial is to walk you through various steps involved in the qualitative and quantitaive study of complex protein conformational transitions using biased molecular dynamics (MD) simulations. 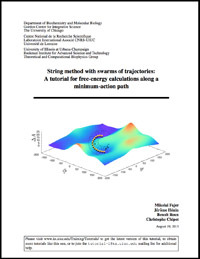 Three specific stages are discussed in three subsequent Sections of the tutorial, namely, nonequilibrium pulling with steered MD, transition path refinement with string method, and free energy calculations with bias-exchange umbrella sampling. 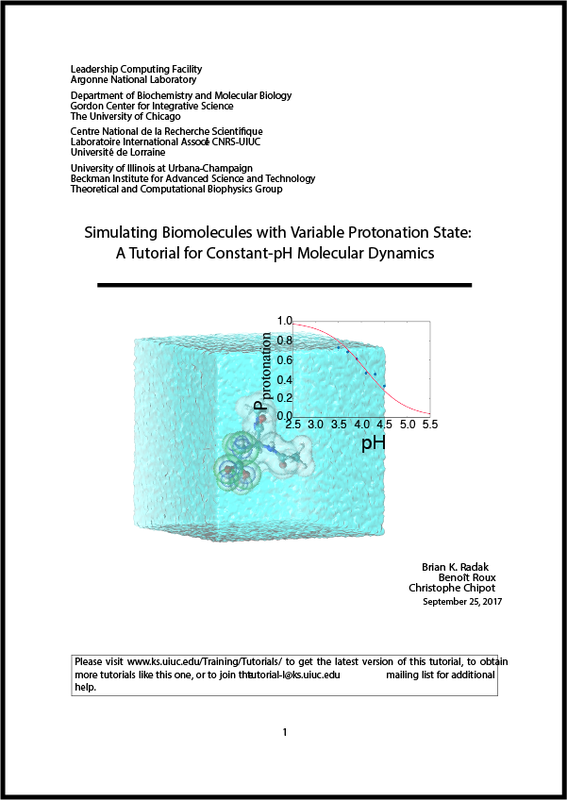 This tutorial is intended to demonstrate the application of molecular dynamics simulations at constant-pH. This method addresses the critical problem of what to do when modeling systems (especially biomolecular systems) that can attain multiple protonation states. While other approaches are possible, using a constant-pH technique naturally accounts for protonation state variation with little or no input beyond the physical model (i.e., the force field). 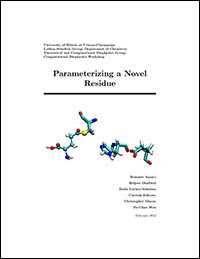 Once completed, several constant-pH simulations can be analyzed to yield titration curves in exact analogy to what is observed in introductory chemistry and biochemistry courses. In this tutorial, we show how to apply the Adaptive Multilevel Splitting (AMS) method to the isomerization of the alanine dipeptide in vacuum. 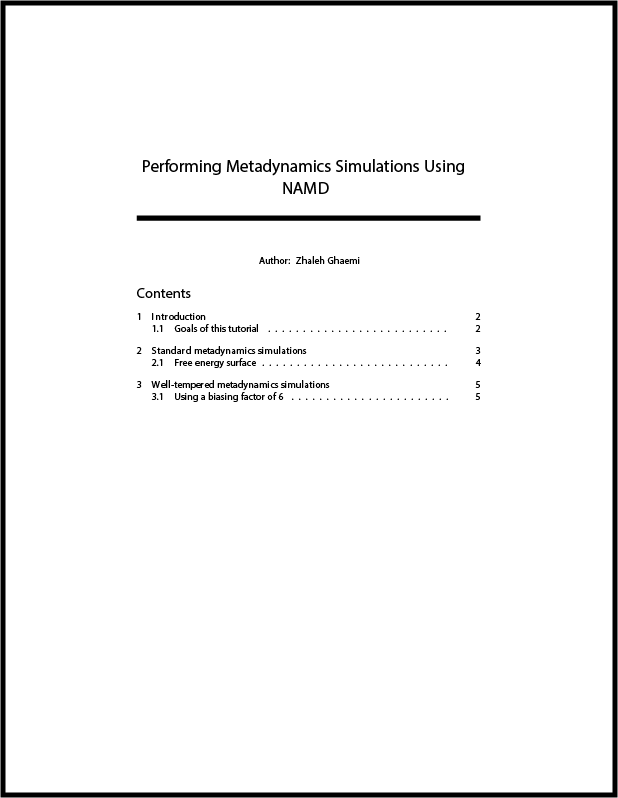 Section 1. gives a description of the AMS algorithm and the proper way to set up AMS simulations, in the context of the NAMD program, for any system using the scripts provided with this document. An application of the method to the case example is showcased in section 2. This tutorial sets out to employ Metadynamics method to enhance the sampling of the Molecular dynamics simulations. For users seeking to learn about a specific use of VMD. Introduces participants to the VMD MultiSeq Tool, which links protein structures to protein sequences and allows users to compare proteins in terms of structure and sequence. 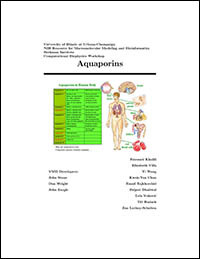 The aquaporin family of membrane proteins, found in a wide range of species including humans, are used for a case study of the applications of the MultiSeq tool. Requires VMD and the VMD MultiSeq Tool. Tutorial works on Windows, Mac, and Unix/Linux platforms. 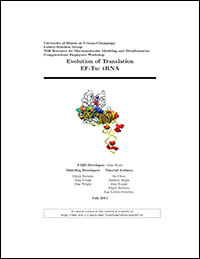 This tutorial makes use of the MultiSeq bioinformatic analysis environment to explore the evolution of the class I aminoacyl-tRNA synthetases, which 'charge' transfer RNA (tRNA) with the correct amino acid. 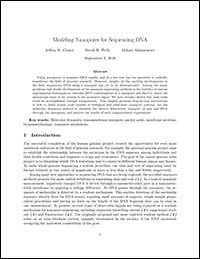 It is intended to be an introduction to MultiSeq, and no prior knowledge of MultiSeq is required. Topics covered include: BLAST searches, multiple sequence alignments, structural alignments, and distance-based phylogenetic trees. This tutorial is intended to be an advanced lesson in the MultiSeq bioinformatic analysis environment, and we recommend the user first go through the Class-I Aminoacyl-tRNA synthetases tutorial prior to attempting this one. In it you will explore the evolutionary relationship of the elongation factor Tu, which ferries 'charged' tRNA from the sythetase to the ribosome. Topics covered include: profile-profile alignments, maximum likelihood phylogenetic trees with RAxML, and scripting with MultiSeq. 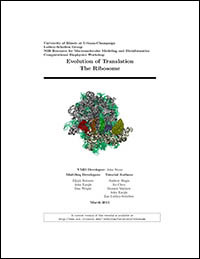 This tutorial leads the reader through major features of the ribosome, the primary translation machinery of the cell. 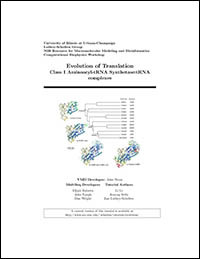 Interactions with the elongation factors, mRNA, and tRNA are explored, as are newly discovered 'sequence signatures' between bacterial and archaeal ribosomes. These signatures constitute much of the evolutionary distance between these two domains of life, and their role in antibiotic resistance is explored. We recommend the reader first complete the Class-I aminoacyl-tRNA synthetase tutorial prior to attempting this one. This tutorial introduces several network analysis methods for examining dynamic signaling in biomolecular systems. 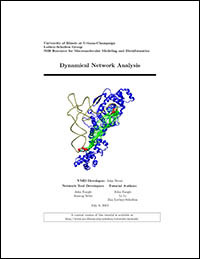 The NetworkView plugin to VMD is used to display and manipulate representations of the networks projected onto the underlying molecular structures. The tutorial is designed such that it can be used by both new and experienced users of VMD, however, it is highly recommended that new users go through the "Using VMD" tutorial in order to gain a working knowledge of the program. Users will also need to download the free Carma software program for the tutorial. This tutorial should take about two hours to complete in its entirety. 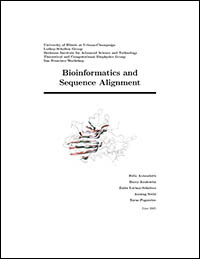 Introduces participants to bioinformatics, the statistical analysis of protein sequences and structures to understand their function and predict structures when only sequence information is available. Requires Needleman-Wunsch alignment programs. Tutorial designed to work on the Mac platform only. 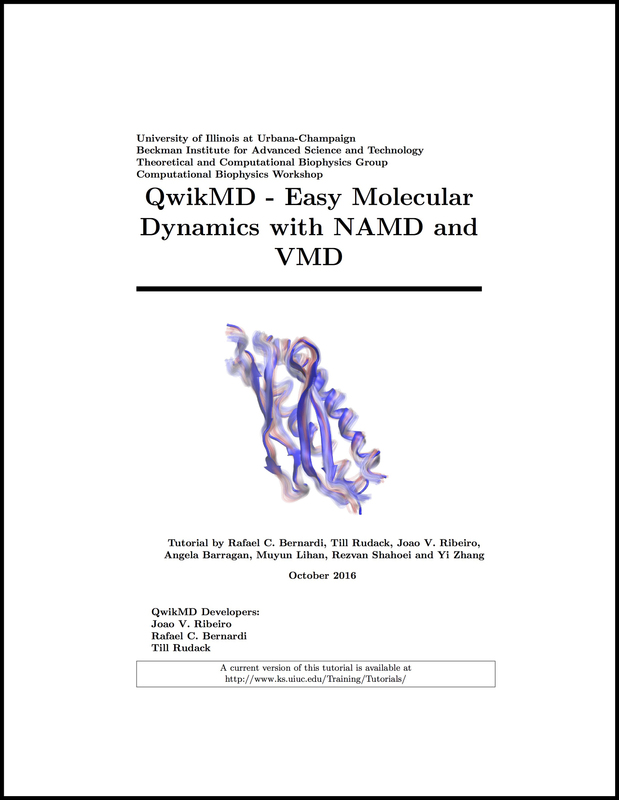 This tutorial is designed to guide users of VMD and NAMD in all the steps required to set up a molecular dynamics simulation of a bionanotechnology device. Tutorial works on Windows, Mac, and Unix/Linux platforms. 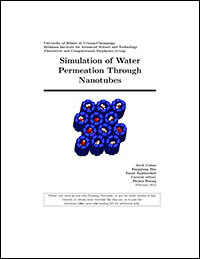 Investigates the permeation of water through nanotubes, as a model for transmembrane permeation of substrates through channels. Requires VMD and the AutoIMD extension to VMD. Tutorial works on Windows, Mac, and Unix/Linux platforms. 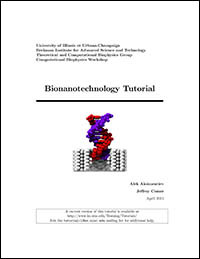 This tutorial provides step-by-step instructions of how to build atomic scale models of biological and solid-state nanopore systems, using the molecular dynamics method to simulate the electric field-driven transport of ions and DNA through the nanopores, and analyze the results of such computational experiments. The tutorial is designed for use on Unix/Linux platforms, but will work on any system with working installations of VMD and NAMD. 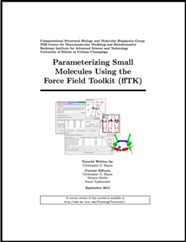 This tutorial introduces users to the steps required to develop force field parameters for small molecules from first principles using the Force Field Toolkit plugin for VMD. Each step of the parameterization workflow is detailed for an example small molecule, ethanol, allowing users to become familiar with technical details and underlying theory of molecular mechanics force fields. This tutorial is intended for advanced users with a firm grasp of how to setup and perform MD simulations and are comfortable working in VMD. Takes participants through a comprehensive example of how one investigates, sets up, and simulates a small nonstandard ligand bound to a protein system; specifically, the glutaminase subunit of the hisH-hisF system and determining the parameters for the non-standard residue. Requires VMD, NAMD, and Spartan. Tutorial works on Windows, Mac, and Unix/Linux platforms. 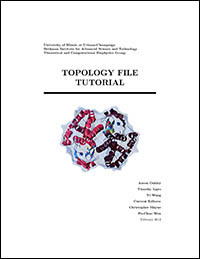 Guides users in how to create topology and parameter information needed for molecular dynamics simulations when it otherwise doesn't exist, by using existing topology information for other molecules without the need for new parameter development. Requires VMD, NAMD suggested as well. Tutorial works on Windows, Mac, and Unix/Linux platforms. 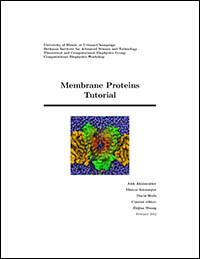 Step by step tutorial for setting up and running molecular dynamics simulations of membrane proteins. Requires VMD, NAMD, and Solvate. Tutorial works on Unix/Linux platform. 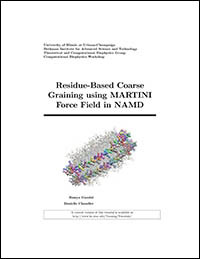 The tutorial reviews residue-based coarse-graining, a method in which several atoms of a biological macromolecule are grouped together in a “virtual” bead (e.g., a single amino acid is represented by 2-5 beads). 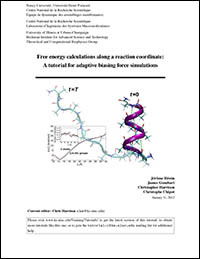 The reduction in degrees of freedom makes the model computationally efficient alternative to atomistic models, allowing for simulations to be run on larger systems and longer time scales. Requires VMD, "Nightly Build" of NAMD (Linux only) or NAMD 2.10 (when available) to complete the tutorial. Tutorial works on Linux only. 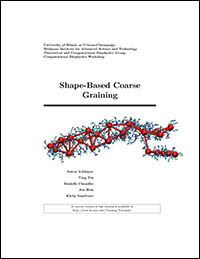 This tutorial presents one method of coarse-graining, called shape-based coarse-graining, which has been quite successful in a number of applications. In this method, a small number of CG beads are used to represent overall shapes of proteins or lipid membranes, with typical ratio of 200-500 atoms per bead. Requires VMD, NAMD, and a plotting program. Tutorial works on Windows, Mac, and Unix/Linux platforms. This tutorial describes how to flexibly fit atomic structures into density maps using the MDFF method. This method can be used to obtain atomic models of macromolecular complexes by combining X-ray structures and cry-electron microscopy maps. Requires VMD and NAMD. Tutorial works on Windows, Mac, and Unix/Linux platforms. This tutorial describes interactive model building with ModelMaker to fill in missing pieces of structures. Requires VMD, NAMD, Rosetta, GNUplot, Modeller, and Situs. Timeline creates an interactive 2D box-plot -- time vs. structural component -- that can show detailed structural events of an entire system over an entire MD trajectory. Events in the trajectory appear as patterns in the 2D plot. The plugin provides several built-in analysis methods, and the means to define new analysis methods. Requires VMD. 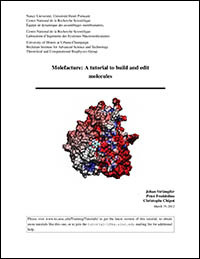 Molefacture is a VMD plugin that has been designed to facilitate the construction and parameterisation of small molecules. 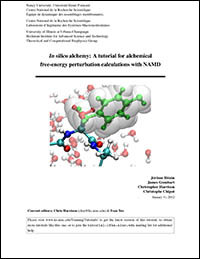 It additionally provides a simple interface to prepare structures and files for free energy perturbation calculations using NAMD. This tutorial serves as a primer for structure building, modification and parameterization using the molefacture plugin of VMD. 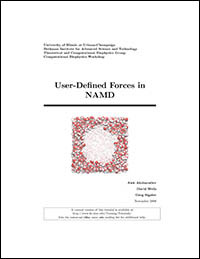 Prior knowledge of NAMD and standard molecular dynamics simulations is assumed. Requires VMD, NAMD, and Amber.